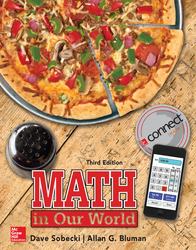 The author team of Dave Sobecki and Allan Bluman created an engaging text and digital program aimed at meeting the needs of today’s liberal arts math students, resulting in the third edition of Math in Our World. This revision focused on further development of critical thinking skills through several hundred revised exercises and examples, still presented within the hallmark style of the Math in Our World program. Carefully chosen questions help students to form a connection between relevant examples and the mathematical concepts of the chapter. Using the engaging writing style characteristic of the text, the authors support concepts through abundant examples, helpful practice problems, and rich exercise sets. The author team was also deeply engaged in the development of the Connect and LearnSmart online content to help ensure a consistent experience for students regardless of medium. The result is an exceptionally engaging program that is able to both effectively and creatively convey the fundamental concepts of a liberal arts math curriculum to even the most hesitant student. I was born and raised in Cleveland, and started college at Bowling Green State University in 1984 majoring in creative writing. Eleven years later, I walked across the graduation stage to receive a PhD in math, a strange journey indeed. After two years at Franklin and Marshall College in Pennsylvania, I came home to Ohio, accepting a tenure-track job at the Hamilton campus of Miami University. I’ve won a number of teaching awards in my career, and while maintaining an active teaching schedule, I now spend an inordinate amount of time writing textbooks and course materials. I’ve written or co-authored either seven or twelve textbooks, depending on how you count them, as well as several solutions manuals and interactive CD-ROMS. After many years as developmental math coordinator at Miami Hamilton, I share the frustration that goes along with low pass rates in the developmental math curriculum. Far too many students end up on the classic Jetson’s-style treadmill, with the abstract nature of the traditional algebra curriculum keeping them from reaching their goals. Like so many instructors across the country, I believe the time is right to move beyond the one-size-fits-all curriculum that treats students the same whether they hope to be an engineer or a pastry chef. “Because we’ve always done it that way” is NOT a good reason to maintain the status quo in our curriculum. Let’s work together to devise alternate pathways that help students to learn more and learn better while hastening their trip into credit-bearing math courses. Since my book (Math in Our World) is written for the Liberal Arts Math and Quantitative Literacy market, I think I’m in the right place at the right time to make a difference in the new and exciting pathways course. I’m in a very happy place right now: my love of teaching meshes perfectly with my childhood dream of writing. (Don’t tell my publisher this – they think I spend 20 hours a day working on textbooks – but I’m working on my first novel in the limited spare time that I have.) I’m also a former coordinator of Ohio Project NExT, as I believe very strongly in helping young college instructors focus on high-quality teaching as a primary career goal. I live in Fairfield, Ohio with my lovely wife Cat and fuzzy dogs Macleod and Tessa. When not teaching or writing, my passions include Ohio State football, Cleveland Indians baseball, heavy metal music, travel, golf, and home improvement. Allan G. Bluman is a professor emeritus at the Community College of Allegheny County, South Campus, near Pittsburgh. He has taught mathematics and statistics for over 35 years. He received an Apple for the Teacher award in recognition of his bringing excellence to the learning environment at South Campus. He has also taught statistics for Penn State University at the Greater Allegheny (McKeesport) Campus and at the Monroeville Center. He received his master's and doctor's degrees from the University of Pittsburgh. In addition to Elementary Statistics: A Step by Step Approach (Eighth Edition ©2012) and Elementary Statistics: A Brief Version (Fifth Edition ©2010), Al is a co-author on a liberal arts mathematics text published by McGraw-Hill, Math in Our World (2nd Edition ©2011). Al also the author of for mathematics books in the McGraw-Hill DeMystified Series. They are Pre-Algebra, Math Word Problems, Business Math, and Probability. Al Bluman is married and has two sons and a granddaughter.